WARNING: This medication has rarely caused serious (sometimes fatal) liver problems. Children less than 2 years old are more likely to develop severe liver problems, especially if they have metabolic problems, severe seizures with mental retardation, brain disease (organic) or if they take more than one drug for seizures. If divalproex sodium is being used in patients with these conditions, then it should not be taken with additional anti-seizure medications. Liver function tests should be performed before and during treatment. Early signs of serious liver problems include vomiting, unusual tiredness, swelling of the face or loss of seizure control in patients with seizure disorder. Tell your doctor immediately if you develop any of these symptoms. This medication has rarely caused severe (sometimes fatal) disease of the pancreas (pancreatitis). This problem may occur at any time during therapy and may worsen quickly. Tell your doctor immediately if you experience stomach/abdominal pain, nausea, vomiting, and loss of appetite while taking this medication. This medication can cause birth defects. Women of childbearing age should discuss the risks and benefits of this medication with their doctor, especially if it is prescribed for a condition other than seizure disorder (such as migraine headache). USES: This medication is used to treat seizure disorders, mental/mood conditions (such as manic phase of bipolar disorder), and to prevent migraine headaches. It works by restoring the balance of certain natural substances (neurotransmitters) in the brain. HOW TO USE: Read the Patient Information Leaflet provided by your pharmacist before you start taking divalproex sodium and each time you get a refill. If you have any questions, consult your doctor or pharmacist. Take this medication by mouth as directed by your doctor. You may take it with food if stomach upset occurs. This medication may be swallowed whole or the capsule can be opened and the entire contents sprinkled onto a small amount (teaspoonful) of soft food, such as applesauce or pudding. Drinking water right after taking the sprinkle and food mixture will help make sure all sprinkles are swallowed. If you spill any of the contents, discard it and start over with a new capsule and another portion of food. All of the drug/food mixture should be swallowed immediately (do not chew). Do not save for future use. Dosage is based on your weight, medical condition, and response to therapy. Use this medication regularly in order to get the most benefit from it. Remember to use it at the same time each day to keep the amount of medication in your blood constant. If this medication is used for seizures, do not stop taking it without consulting your doctor. Your condition may become worse if the drug is suddenly stopped. Your dose may need to be gradually decreased. Divalproex sodium does not relieve acute migraine headaches. Take other medications as directed by your doctor for acute attacks . Inform your doctor if your condition does not improve. SIDE EFFECTS: See also Warning section. Diarrhea, dizziness, drowsiness, hair loss, blurred/double vision, change in menstrual periods, ringing in the ears, shakiness (tremor), unsteadiness, weight changes may occur. If any of these effects persist or worsen, notify your doctor or pharmacist promptly. Remember that your doctor has prescribed this medication because he or she has judged that the benefit to you is greater than the risk of side effects. Many people using this medication do not have serious side effects. Tell your doctor immediately if any of these serious side effects occur: signs of infection (e.g., fever, persistent sore throat). Tell your doctor immediately if any of these unlikely but serious side effects occur: chest pain, easy bruising/unexplained bleeding, fast/irregular heartbeat, swelling of hands/feet, uncontrolled eye movement (nystagmus). A small number of people who take anticonvulsants for any condition (such as seizure, bipolar disorder, pain) may experience depression, suicidal thoughts/attempts, or other mental/mood problems. Tell your doctor immediately if you or your family/caregiver notice any unusual/sudden changes in your mood, thoughts, or behavior including signs of depression, suicidal thoughts/attempts, thoughts about harming yourself. Tell your doctor immediately if any of these highly unlikely but very serious side effects occur: dark urine, persistent nausea/vomiting, severe stomach/abdominal pain, yellowing eyes or skin. Severe (sometimes fatal) brain disorder (encephalopathy) has rarely occurred, particularly in patients with certain metabolic disorders (urea cycle disorders). Tell your doctor immediately if you develop unexplained weakness and vomiting or sudden mental changes. If you notice coated particles in your stool, they are harmless. These specially coated particles do not completely dissolve and may be passed in the stool. A serious allergic reaction to this drug is unlikely, but seek immediate medical attention if it occurs. Symptoms of a serious allergic reaction include: rash, itching/swelling (especially of the face/tongue/throat), severe dizziness, trouble breathing. This is not a complete list of possible side effects. If you notice other effects not listed above, contact your doctor or pharmacist. In the US - Call your doctor for medical advice about side effects. You may report side effects to FDA at 1-800-FDA-1088. In Canada - Call your doctor for medical advice about side effects. You may report side effects to Health Canada at 1-866-234-2345. PRECAUTIONS: See also Warning section. 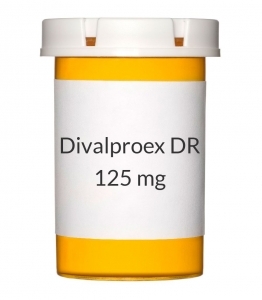 Before taking divalproex sodium, tell your doctor or pharmacist if you are allergic to it; or to valproic acid or valproate sodium; or if you have any other allergies. This product may contain inactive ingredients, which can cause allergic reactions or other problems. Talk to your pharmacist for more details. This medication should not be used if you have certain medical conditions. Before using this drug, consult your doctor or pharmacist if you have: liver disease, pancreatitis, certain metabolic disorders (urea cycle disorders). Before using this medication, tell your doctor or pharmacist your medical history, especially of: alcohol abuse, bleeding problems, brain disease (dementia), kidney disease, low body water (dehydration), poor nutrition. Before having surgery, tell your doctor or dentist that you are taking this medication. This drug may make you dizzy or drowsy or cause blurred vision. Do not drive, use machinery, or do any activity that requires alertness or clear vision until you are sure you can perform such activities safely. Limit alcoholic beverages. Caution is advised when using this drug in the elderly because they may be more sensitive to its side effects, especially drowsiness or tremor. This medication is not recommended for use during pregnancy. It may harm an unborn baby. However, since untreated seizures are a serious condition that can harm both a pregnant woman and her unborn baby, do not stop taking this medication unless directed by your doctor. If you are planning pregnancy, become pregnant, or think you may be pregnant, immediately talk to your doctor about the benefits and risks of using this medication during pregnancy. Your doctor may switch the type of medication you use during pregnancy. See also Warning section. This medication passes into breast milk. While there have been no reports of harm to nursing infants, consult your doctor before breast-feeding. DRUG INTERACTIONS: Your healthcare professionals (e.g., doctor or pharmacist) may already be aware of any possible drug interactions and may be monitoring you for them. Do not start, stop or change the dosage of any medicine before checking with them first. Before using this medication, tell your doctor or pharmacist of all prescription and nonprescription/herbal products you may use, especially of: certain antidepressants (e.g., amitriptyline, nortriptyline, phenelzine), certain benzodiazepines (e.g., clonazepam, diazepam), certain antibiotics (carbapenems such as doripenem, imipenem), mefloquine, other medications for seizure (e.g., carbamazepine, ethosuximide, felbamate, lamotrigine, phenobarbital, phenytoin, rufinamide, topiramate), rifampin, vorinostat, warfarin, zidovudine. Low-dose aspirin, as prescribed by your doctor for specific medical reasons such as heart attack or stroke prevention (usually these dosages are 81-325 milligrams per day), should be continued. Consult your doctor or pharmacist if you are using aspirin for any reason. Tell your doctor or pharmacist if you also take drugs that cause drowsiness such as: antihistamines that cause drowsiness (e.g., diphenhydramine), medicine for sleep (e.g., sedatives), muscle relaxants, narcotic pain relievers (e.g., codeine), psychiatric medicines (e.g., phenothiazines such as chlorpromazine), tranquilizers. Check the labels on all your medicines (e.g., cough-and-cold products) because they may contain ingredients that cause drowsiness. Ask your pharmacist about the safe use of those products. This drug may affect certain lab tests (e.g., urine ketones). Make sure laboratory personnel and your doctors know you use this medication. This document does not contain all possible interactions. Therefore, before using this product, tell your doctor or pharmacist of all the products you use. Keep a list of all your medications with you, and share the list with your doctor and pharmacist. OVERDOSE: If overdose is suspected, contact your local poison control center or emergency room immediately. US residents can call the US national poison hotline at 1-800-222-1222. Canadian residents should call their local poison control center directly. Symptoms of overdose may include: excessive drowsiness, coma, irregular/slowed/skipped heart beats (heart block). NOTES: Do not share this medication with others. Laboratory and/or medical tests (e.g., drug levels, liver function tests, complete blood counts, clotting tests) should be performed periodically to monitor your progress or check for side effects. Consult your doctor for more details. STORAGE: Store at room temperature below 77 degrees F (25 degrees C) away from light and moisture. Do not store in the bathroom. Keep all medicines away from children and pets. Do not flush medications down the toilet or pour them into a drain unless instructed to do so. Properly discard this product when it is expired or no longer needed. Consult your pharmacist or local waste disposal company for more details about how to safely discard your product. Information last revised July 2011. Copyright(c) 2011 First Databank, Inc.